In 1919, a small group of women served with the United States Navy as nurses, answering to male officers. 23 years later, in early Aug 1942, female officer Naval Reserve Lieutenant Commander Mildred McAfee was commissioned into the US Navy amidst World War II to head up the Women Accepted for Volunteer Emergency Service program (WAVES). The use of the word "emergency", however, signified that when the effort to resurrect female service was in the planning stages, US Navy brass thought female service would cease when the emergency, or the war, came to and end. The reason for that was due to political resistance from many who did not believe women had a place in the US Navy, and for the program to take place, creative intrigue had to be used. Despite the resistance from conservative officers, however, the demand was clearly there; for example, as early as Jan 1942, the Office of Naval Intelligence was recruiting female college students. Even as President Franklin Roosevelt signed the Navy Women's Reserve Act into law on 30 July 1942, little did people know that female service in the US Navy would become something that would last far beyond the "emergency". 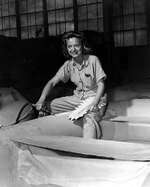 By mid-1943, 27,000 American women served in the WAVES program. While their WW1 counterparts served only as nurses and secretaries, these WW2-era women took up far more responsibilities. Secretarial and clerical jobs still made up a large portion of WAVES positions, but thousands of WAVES personnel performed other jobs such as aviation mechanics, photographers, control tower operators, and intelligence personnel. In late 1944, the WAVES program began accepting African American women at the ratio of one black woman for every 36 white women enlisted in the WAVES program. By the end of the war, over 84,000 women served in WAVES with 8,000 female officers, which constituted 2.5% of the US Navy's personnel strength. After the war, the US Congress passed the Women's Armed Services Integration Act (Public Law 625) on 12 Jun 1948, allowing women to gain permanent status in all military branches of the United States, which put the WAVES program into obsolescence (although people still referred to female members of the Navy as a member of WAVES well into the 1970s). After the passage of the Women's Armed Services Integration Act, on 7 Jul 1948, six women were sworn into the regular Navy: Kay Langdon, Wilma Marchal, Edna Young, Frances Devaney, Doris Robertson, and Ruth Flora. On 15 Oct 1948, eight women were commissioned as the first female officers of the regular Navy: Joy Bright Hancock, Winifred Quick Collins, Ann King, Frances Willoughby, Ellen Ford, Doris Cranmore, Doris Defenderfer, and Betty Rae Tennant. "I Want to be a Friend of Yours"
One blue stripe would be all right. But oh, for a little bit more. Source: United States Navy Great Lakes Naval Museum, United States Navy Naval Historical Center, Wikipedia. this information is not helpful at all to me i want a quote from a first hand account by a woman in ww2 servin in the war. thanks a lot. My Aunt was on the cover of one of the magazines when she was in the Waves. Her name was Dorothy Beckley-Harvey-Smith. Not sure which last name was hers while she was in the Waves. Would love a picture of it, for my mother, her sister. Thank You so much for this website. I am using it to do train on Women in the Navy. This website has a great amount of knowledge on it and who ever is supporting this is a great asset to the world. Thank You again. Does anyone know who was the WAVE Lt. Cdr. stationed at Jacksonville NAS about 1943 or into 1944, doing psychological studies on aviators? Does anyone have information about a WAVE named Marcella Svejda. She was stationed in Japan. Fabulous that women had the chance to do all this considering what generation they were. They helped pave the way for the rest of us. Is there a database to find a relative that served in with the WAVES? If so, does it tell where they were stationed and what they did? Excellent site helped me with my national history day project! thanks a bunch! My mother, Bettie Helen Boyce was in the Waves during WWII. When going through hr chests full of stuff, we came across this poem. She could not remember which one of the "girls" serving with her borrowed her typewriter and wrote it.. “Won’t you step into my parlor”, Said the spider to the fly. “Won’t you step into the parlor”, And his look was very sly. Her heart began to flutter, She wanted so to flee, For the spider was a sailor And her fate was plain to see. Now the fly was very timid, And she didn’t want to go But the spider was so handsome And his urging touched her so, With one last look at freedom She stepped into the room, As the door closed gently after, She realized her doom! Oh! She looked at him for guidance It was up to him she knew. His voice came soft, compelling, “It’s the only thing to do.” With this word of assurance, She said, “It can’t be wrong” Come on let’s do it quickly, I’ve waited now too long.” He said, “You son’t regret it, It means a lot to me. For when we’re in the service, We miss a lot, you see. It’s girls like you that cheer us And send us on our way, There’d be a lot more like you If we could have our way. In her breath there was a flutter, And her heart began to race. Her lip began to tremble, And the color left her face. “The only ones who don’t”, he said, “Are either fools or knaves”, So with a sigh of sweet submission, SHE ENLISTED IN THE WAVES!! thnx ths helped me alot on mi social studies world war 2 project!!!!!!!!!!!!!!!!!!!!!!!!!! I wondered if there is a list of the women who enlisted. I have a Wagar that enlisted, and I want to know if there were any pictures of her, there. thank you so much!! this information helped me a lot on my WWII project about the Home Front and the WAVES!! Looking for any info regarding Melba Hill who was stationed in Corpus Christi. Did anyone find a database of names? Does anyone know if Waves are allowed to be buried in a Veterans cemetery? I think it depends if they served active duty. Does the Navy count a nurse serving on a ship as active duty? My mother and her sister were two of the 1st 5 thousand women who enlisted into the WAVES. The answer to question number 11 is "Yes". My aunt Dorothy (Drake) Castek had a hush hush job of translating German messages in England. She was sworn to secrecy for her entire life. My own mother, Rita (Drake) Harvey remained in the WAVES after the war. There were only 2 thousand remaining after 1945. From that number the Navy built on idea that women could enlist into all the branches of the Armed Forces. It took an act of Congress in 1948 and signed by the President to accomplish this. My mother and aunt are in the picture of the ladies of recruits at the bottom of page 1. Forth from left back row and the one in front of her is my aunt. Answer to question 28 is "active duty". WAVES are allowed to be buried with full military burials in a private or national cemetery. Looking for WAVES who passed through the Charleston Navy Yard in South Carolina - or are natives of/currently reside in South Carolina. Email me. I think this web site is great it needs a data base though because I'm looking for a women named Elizabet w. Daugherty who was a wave. Could someone tell me the Pharmasist Mate rating of Betty Lou Worrall who was a WAVE:WWII? She was from Denver, Colorado. Thank you. Hi Aunt Marilyn, Found a Waves hat with pin and buttons. Thought it was Mom's but has the intials of BLS inside it. Any ideas of the S? I was doing an iSearch paper for my Interdis class. I didn't k now anything about women and there role of being in it. I looked at this website and it became a big help in me actually writing it. It was a great tool in helping with my paper, so thankss. this website isn't half bad. it gives a good amount of information on the WAVES program of world war 2. I wanted to learn about African American woem in World War 2 and all I got from here "one black women to 36 white women". NOT HELPFUL!!!!! I found an ring that I think may be a WAVES graduation type ring. It is 10K gold with a blue stone. On the stone is an anchor overlaying a 3 bladed prop. On each side of the band is engraved "WAVES". Can anyone confirm that this type of ring was purchased or issued to these brave women? There are the initials B.D. on the inside of the ring, but I'm not sure if that is the manufacturer or former owner. Any info would be appreciated! I am looking for a Dorothy M. Gunlock who was in the WAVES during WWII. Any information would be helpful. Did anyone serve on the WWII ship, Tranquility? I know someone who served as a nurse and has wonderful stories. Please contact! My mother was a WAVE and went to Boulder, Colorado where she learned Japanese. She translated sailing directions in Washington, DC and then at the close of the war went to Japan for four years where she worked as a translator in the Allied Translator & Interpreter Service for the Supreme Command. We need a search service so we can find their records on-line! Hi! Does anyone know of any WAVES that served from 1943-1944 in the San Diego Area? Please let me know, I am trying to reunite hem with another WAVE who served there who is now in Chicago. I also have a waves ring exactly as described above. I found it after my grand parents passed. It also has D.B inside. Did you find any info about it? (Cecilia) Dorothy Beattie, USN WAVES - Rank: Y1. 22 Nov. 1910, Narrows Island, Guilford, CT-15 Mar. 1988, New Haven, CT. Graduate of Stone Business College; enlisted 8 Dec. 1941, serving to Apr. 1946. Attended University of Oklahoma. Served in San Diego and San Francisco, CA; transferred to Civil Service as Stenographer for International Military Tribunal for the Far East in office of Sir William Webb, President and Member from Australia from 6 Aug. 1946 to 5 Dec. 1948, in Japan. Retired after 30 years by Joint Chief of Staff, at the Pentagon, Washington, D.C.
My mother was a SP2 in Telecommunications, USN WAVES during WWII. Could you please tell me what SP2 meant? Thanks. ummmm...... Ima writng a speech about W.A.V.E.S and need a little infor can i have some help??? Looking for waves stationed in China Lake CA.in or around 1942. My mother-in-law was a yoeman there. Any help would be appreciated. Does anyone know a WAVE from the early 40's named Margaret Elizabeth Sommers? We are searching for any information or photos of her. Does anyone know any WAVES who were stationed in Pasco, WA during WWII? I am looking for stories for an exhibit I am putting together. I am hoping to put some names to the faces from our photo archive. Wonderful site. Have not been able to find much on the Waves. My husband's grandmother was a Wave from Arkansas, but she did not talk much about it. Would love to find information or her service records? Can anybody help. It would mean alot to my husband. Some oral history interviews of women who served in the Women Accepted for Volunteer Emergency Service (WAVES) during World War II are available for viewing from the Illinois Veterans History Project YouTube Channel. Link is http://www.youtube.com/user/ilveteransproject Just click on World War II, 1939-1945 playlist. Thank you, my Grandma was an active WAVES during WWII. I did no know much about what that was until I found this site. I'm trying to find the records of my mother's tour of duty. Among the first women taken in and housed at Hunter College in 1942. She was, we were told, the first female aviation technician in the Naval Air Corp. She installed radios in airplanes. How would I go about getting this info? I do not have here SS#... But her name was Sallie Curtis Easley. My mother's name is Edith Ellen Briggs married name Rollins. She was a Navy WAVE during WWII. She was born and raised in Arkansas until she joined the Navy. She was at Hunter College, and her Naval occupation was in intelligence. In 1944 she married Stanley Rollins and lived in Washington DC. She was invited to have lunch with Eleanor Roosevelt at the White House. I am trying to research her time served in the Navy.. Not having any luck so far. Any info would be greatly appreciated. Update: My mom's name is Edith Ellen Briggs. She was a Navy WAVE during WWII. She attended boot camp at Hunter College, and was stationed at Dayton, Ohio as a code breaker. She helped decipher enemy communication that helped to save lives, and shorten the war. She worked at the Naval Machine Computer Lab at the National Cash Register Company. My mom died of cancer in 1993, never revealing to anyone what her role was during the war. If anyone knew my mom, or worked with her as a code breaker, please contact me. I would love to know what her life was like as a Navy WAVE. Any pictures or stories of Ann Antonia DeAngelis. Navy WAVE from class in New York City (Hunter College) 1943. She was from Irwin, PA Thank you, Anna M. Chalmers, her daughter. My mother Arletta Bernice Coates, a wave, and stationed in Nevada. Looking for any information. My mother was Florence Tichenor Cherry from Owensboro, Ky I think she was stationed in Pensicola, Florida where I was born in 1945. she died in June of 1950. Any information would be greatly appreciated. I served with lots of WAVES in the 1950s,up untill they reverted to USN WIMs We at 'togeterweserved.com ,would love you all who served, join us at the Above site ,over 500,000 Sailors on board ,and 1 WAVE, from 1945,HER Name is Bobbie Poole! Come Join us ,lots to talk about!and Pictures Galore. Talk to Diane Short! First gal to go aboard Ship. Sites Admin !Happy Sailing !! Am looking for a US Navy WAVES ring. I never got one when I graduation from boot camp at NTC Bainbridge in 1969 and would love to have one. My wife's aunt Genny is 94 years old and is still alive was a chief petty officer in the WAVES. She has stories told at different family events.Thank you for everyone that served. My mother, Patricia Ruth Hamilton, born in 1924, was a WAVE. She worked as a radio operator sending and received secret code. I am not sure where she was stationed. After WWII ended, she went to Toyko Japan and served with the Occupational Army there, as a secretary for 1-2 years. She passed away from cancer in the early 1980s. i loved my years' in the WAVES. Trained at Hunter College, New York (icy cold marching from class to class with winds blowing off the Atlantic), what i wouldn't give to be able to be back there and know what i know now. Worked at BuPers, Arlington, Va., stationed at Arlington Farms. My Mother was a Radio Wave stationed in San Francisco during WWII. She also did her training at Hunter College in New York. She used to sing a song using the morse code which went something like "dit dit di da da means" ........ that is all I remember, and I may not even have that correct. Is there anyone on this post that would remember this little song. My Mom passed away in 2010 at 90 years old. Her name and rank Julia Murphy RM3/c if anyone recognizes her, and she served with her sister Ruth Murphy. My mother Betty Jjean Keasler was a young girl from Illinois whose joined the Waves and was served in Washington D.C. as a typist. I still have her handbook and pictures. Is there a memorial to them? I am looking for the family of a flight nurse from iwa jimo 1947 on#478152. I would like to return property belonging to unnamed nurses family. I have read that in WWII, the first digit of the USN Service Number was a code for the recruiting district. Is there a list of these codes available? Otherwise, does anyone know what district 7 would be? I served as a Wave and am now 96 years old. I work out of Madison during the war. I was wondering how many waves are still alive. Is it possible to see if my Mom, Pauline Sanford, who served in Hawaii is the oldest living WAVE? She is 97. I see Ms. Ann Wilkins Nosek, in the above comment, is 96. Hi Ann, sorry to say my Grandma Marilyn McDoogle passed away just last week. She was stationed in Virginia 1944 -45. Anyone have any information about a wave named FLORENCE JOHNSON? I found an oil painting of a navy wave woman, it's painted by a famous artist Glenn Sheffer. The painting was found in Chicago. My question is, is there a database that has a photo of all Navy waves women so I may be able to match the photos with my painting. Looking for information on my Aunt, Alicia R. Thomas. She was a WAVE and did basic training in Dallas, Texas in 1944. Hoping you can help with more info. Looking for any information about Emilie Doncourt of Queens, NY. Edith D Crooks ("Crooksie") was my mom. Served in Hawaii, NC, Texas. She just passed away at age 95. Not sick - tired and wanted to join my dad in heaven. RIP MOM!!!! How can I find documentation for my aunt's WAVES Service? I met a wonderful, beautiful lady by the name Louise. She is Italian and I believe she was from New York. She was in the Waves project during WWII. She is 95 yrs.young. She lives in Texas at a nursing facility that my father lives at. She is the activities coordinator and everyone loves her. Just wanted to share. Waves is still going strong. Thank you for your service. I am researching WWII Veterans for the Browns Valley Cemetery in Browns Valley, California. One of my Vets was a Navy Wave. I can't seem to find her on either my Ancestry or Fold 3 accounts. Her name was Jane Ketzle (later her Married name was Poor) on her tombstone it reads SN1 US Navy WWII. She was born 21 Aug. 1915 and died 13 Feb 2007. Julie Delannoy 93...Uncle Gus & Aunty in WWII Navy Uniforms. Aunt Julie is one of the oldest living Waves from WWII. My Mother Edith M. Gobrecht (Bleitz), served as a Chief Specialist (S) and was a member of the Singing Platoon. While Stationed at Naval Base Coronado, she also lead a Singing WAVES group. I'm trying to find more info about her and her service. I purchased a W.A.V.E uniform blazer at a thrift store in Arizona with the name B.A. PIERSON and would love to find a relative or friend that knew her and would want this item. Thanks! My mother— Margaret Collins, Lieutenant worked in Intelligence, primarily in Florida. I would appreciate whatever information there is about her. my aunt Margie Esther Durham was in the WAVES (we had a photo of her in her uniform that was lost in a fire). I think she served in Southern California 1942-1946. She married in 1948 & died in 1949. I can find no records, etc and would appreciate any help. My friend's relative, Alice Marie Kinman, served in the WAVES during WWII. Would there be any records, or information about her there? My mother served in the WAVES during WW II. In the 1980s she was a founding charter member of Waves National Golden West Unit 31 in Orange County, CA. I have a scrapbook and additional information to donate if there is an archive on this topic. So my great grandmother served in the WAVES im am doing a social study fair about them. If anyone could point me to another thing pls do. Hi. We got in a WWII Dog Tag for a "Sylvia Muriel Franson 704-18-68 USNR-AB T-6/43"
Can you tell me if this was a WAVE or possibly a nurse, I don't think the Navy kept WASPs. I just found discharge papers for my elderly mother. Found out that she had been a weekend warrior in the WAVES not long after WWII. Does anyone know if she would now be eligible for any VA services? I am attempting to get more information regarding a coin I found that has the inscription "Wave Platoon Leader B. A. Schultz, Co 35" that was from the Hospital Corp school in Great Lakes IL. Any help would be greatly appreciated. Just looking for a great in memory saying or poem to add to a tattoo I wish to get in memory of my Mom Mom who passed back in 03 but I couldn’t figure out what to get until today when I discovered that the waves had a awesome looking anchor that I could get. My mom is a wave and will turn 96 in January. How can I find out who is the oldest living wave? My mother Nell Stapleton Smith Lutz was a Wave in WWII. She will be 97 later this month and she would love to be in touch with any other WAVES who are still alive. Thank You!!! My mother, Emily Williams, was a wave. graduated hunter college 1945 platoon 5 company 101. trained pilots on Link trainers at Corey field Pensacola in 1946. Like to find out anything more I could. My mother Dorothea (Dolly) Kumin who turned 95 this year was a Wave during WWII. She did basic training in Stillwater, OK and was stationed in Bureau of Personnel in Washington DC. Anyone out there who remembers her? Edith M. Lovrien was a WAVE in WWII. I would like to hear from anyone who was her friend. Signed, her godchild Plovrien. My mother was a Navy WAVE during WW2. She decoded intelligence in Washington DC. Her name was Muriel Haworth. I have many wonderful pictures, letters, and an autograph book that is full of names and sweet stories. Would love to share. We just lost mum in December. She was almost 95 and still feisty. PS: Mum had a fully military service and was buried in her WAVES uniform. She looked beautiful! Who would I reach out to if one wanted to honor the Waves by using the Wave colors and Waves symbol used on the hat? We would like to know for a program we are working on. Looking for my birth mother who was in the WAVES during WW2, her name was Emma Mclaughlin. How could I find her records? Hope to find Norma Mae Schlicht WWII military record. US Navy WAVE.